From Goodreads: "Budding designer Lola Nolan doesn’t believe in fashion . . . she believes in costume. The more expressive the outfit -- more sparkly, more fun, more wild -- the better. But even though Lola’s style is outrageous, she’s a devoted daughter and friend with some big plans for the future. And everything is pretty perfect (right down to her hot rocker boyfriend) until the dreaded Bell twins, Calliope and Cricket, return to the neighborhood. When Cricket -- a gifted inventor -- steps out from his twin sister’s shadow and back into Lola’s life, she must finally reconcile a lifetime of feelings for the boy next door." Let me start by saying that I started and finished this book in one afternoon. This very rarely happens for me anymore, not necessarily because the book is bad, just because I get tired of reading for however any hours straight. 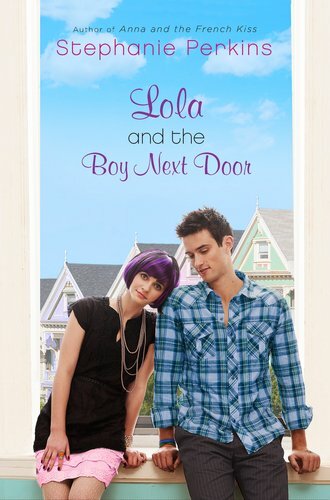 But I found Lola and the Boy Next Door to be a fairly quick and a very good read! I really did love this book, it was a lot of fun, but with some deeper issues as well. It starts out with Lola, a 17 year old girl who has had an interesting upbringing. Her birth mum is an alcoholic and a drug addict who gave her up for adoption. She doesn't know her birth father, but she has heard stories. She was adopted by a relative of her mother, and now she has two dads. Well technically I guess you would say three dads? Nathan and Andy are her adoptive parents who are very protective of her. Especially when it comes to her older boyfriend Max. Max is 22 and in a band. Her parents do not approve. She says she is in love with him, and he with her. But there is one person that she never really got over. His name is Cricket, her old neighbour. Things didn't end well with Cricket before him and his family moved. But there is always the possibility that they will move back in. Lola dreads the day. Every time there is a moving van she freaks out, until she confirms it's not them. Only this time, the moving van is theirs and Cricket is back. I love Cricket (though I don't really like the name), he is lovely, though Lola doesn't think so after the way he treated her 2 years ago. We later find out that it was all his sisters doing and both Cricket and Lola were hurt in the process. When he moves back, he sends Lola through a loop. They talk more and more and Cricket expresses feelings for her, but there is a problem - Max. I really enjoyed this book, it's the first one I have read of Stephanie Perkins. I have Anna and the French Kiss on order from my local library. Though Anna and St Clair are in this book as friends of Lola's, you don't need to read Anna and the French Kiss first. Perkins has created a great story with believable characters that I just loved. If you haven't read this one yet, then I would say, you should get on that soon! I really want to read this one! I loved Anna and the French Kiss. I will have to get it soon. I can't wait to read this one and Anna and the French Kiss!